Hamsters are so well-known as pets today that many people aren’t even aware that wild hamsters are also alive and well in many parts of the world! But the truth is, hamsters became part of the pet trade only within the last century. Prior to around 1936, wild hamsters were the only type of hamsters that even existed. 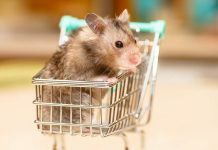 If you are curious to learn more about where your furry little pocket pet came from, or if you are trying to decide if a pet hamster is the right pet choice for you, learning more about wild hamsters can be a fun and fascinating journey to take! The wild Syrian hamster or golden hamster, as the pet species is often called today, made the arid desert their home for centuries before they were imported to the United States in 1936. Perhaps we would have never known about hamsters as pets if it hadn’t been for a biologist named Israel Aharoni, who was working in Israel and attempting to locate certain animals for potential use in medical labs. The golden hamster, known to him only as “Mr. Saddlebags (a local nickname),” was on his hit list of potential wild prospects. In 1930, fortune smiled on the biologist and his team (although perhaps not so much on the hamster, as it turned out) when they discovered a nest of the small golden mammals. They took some of them back to the lab for study. The wild hamsters proved incredibly resourceful. They ate one another and chewed their way out of their laboratory habitat. Finally, they mated and produced more baby golden hamsters for study in the lab. Later, they did this in homes around the world. Interestingly, studies of wild hamsters in their native habitats have continued to be rare. There are only a few such documented studies of wild hamsters. Not very much is known about how their species or their wild territories may have shifted or changed through the centuries. Can hamsters survive in the wild? We may not know as much as we could about wild hamsters, but what we do know is that hamsters have existed in the wild for far longer than they have occupied space in our bedrooms and family living areas as pets. These small, resourceful, and sometimes downright scrappy little mammals have actually evolved to survive and reproduce quite well in a world where pretty much everything wants to eat them for dinner! In fact, sadly, the biggest threat to wild hamsters today is actually not due to predation by wild predators – but because of people. Diminishing natural habitat (mostly due to farming and agriculture or to commercial and residential construction projects) has been compounded by an increasingly toxic natural environment. For certain wild hamster species in some parts of the world, ongoing military conflict has reduced their natural living space to a point of genuine concern. But when left to their own devices, wild hamsters get along just fine in spite of the natural ever-present threat of predation. Wild hamsters left to their own devices spend much of their time digging a fascinatingly complex network of underground tunnels. They use these tunnels to safely forage for grasses and insects, store food sources for consumption later, breed and raise their babies, rest and hide from predators, and, seasonally, hibernate through the winter months. These underground tunnels also help provide a more stable, livable temperature for the hamsters and their young than the temperature extremes present just above on the ground level surface. And the burrows also give the hamsters a good head start in digging down deep into the soil to hibernate when the cold season arrives each year. Not every wild hamster species is represented in the hamster pet trade today. Most notably, the European or common hamster is still one hundred percent wild and exists in the wild only in small, specialized areas throughout Europe. Each wild hamster species has evolved to seek out its own specialized diet, and also exhibits certain specialized skills to ensure its survival in the wild. For example, the larger golden (Syrian) hamster lives a mostly solitary life both in the wild and in captivity, where it only comes together with others of its kind to mate or to fight for the right to mate. If you put two male pet Syrian hamsters together in a cage, you will see exactly the same thing you would see in a wild setting – fighting. Chinese dwarf hamsters, like Syrian hamsters, will live alone both in the wild and in captivity. In contrast, many of the much smaller dwarf hamster species, like the Roborovski and the Russian hamster species, have evolved in the wild to live in small family groups. There is safety from predators in numbers, after all. And many (although not all, as the Chinese dwarf hamster showcases) of these species will also fare much better as pets when allowed to live in pairs or groups. As the brief history of how wild hamsters became pets outlines, the first known wild hamsters that became pets hailed from the Middle East in the region where Syria sits today. Syrian hamsters are currently classified as vulnerable by the International Union for Conservation of Nature (IUCN) Red List. They have a very small wild territory in a region of the world (Syrian/Turkey along the border). The area is beset by ongoing conflict as well as habitat loss to other human activities. This has made their survival in the wild far from assured. The wild dwarf hamster, makes the highly variable sandy, desert-like spaces of Mongolia their home. In captivity, the wild dwarf hamster is represented by pet breeds such as the Campbell’s or Djungian hamster. The Siberian wild hamster, a wild Russian hamster, lives in – no surprise here – Siberia. Like the Campbells hamster, the Syrian’s wild hamster habitat can be quite extreme temperature-wise. Temperatures routinely swing from 100 degrees Fahrenheit (37.77 degrees Celsius) down to 40 degrees Fahrenheit (4.44 degrees Celsius) and back up, even within a single day! The Siberian hamster is also called the winter white because it has a unique ability to change its normally sandy-colored coat to a pure white in winter. This helps the hamster hide in plain sight from predators. The Roborovski hamster, or Robo hamster, is also more commonly known as the desert hamster in the wild. The Robo hamster lives in a similar territory to the Siberian hamster, although this hamster’s territory extends into parts of northern China as well. 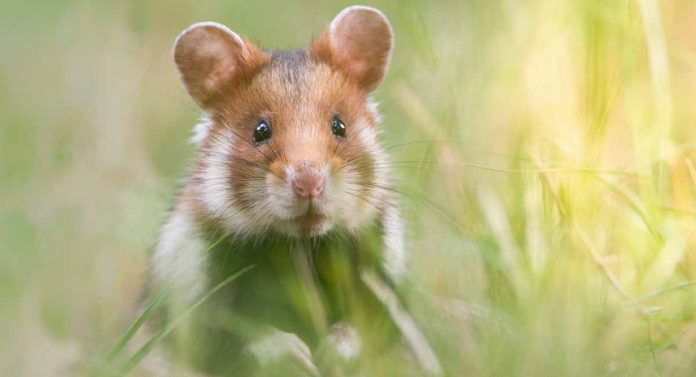 The wild European hamster exists only in the wild as a protected species. It is also called the “common hamster. ” But, unfortunately, its protected status means it is far from common in the wild today. This hamster’s wild territory includes parts of Siberia, Russia, Greece, Romania, China, the Ukraine, Hungary, Germany, Belgium, France and the Czech Republic. Eeports indicate all populations are steadily declining at alarming rates. While this decline is not currently reflected in the European hamster’s IUCN status as “of least concern,” several local activist and conservation groups have sounded the alarm in their respective regions and have called for ongoing protection for this vulnerable species. In appearance, the wild European hamster looks most like the pet Syrian (golden) hamster. However, it can reach 13 inches long. 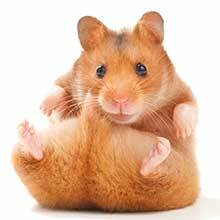 The European hamster is closer size-wise to the guinea pig than to any pet domestic hamster. Where can you find wild hamsters? Wild hamsters, unlike their domesticated pet cousins, are afraid of people. They will spend up to 95 percent of the average day hiding. Hamsters are also largely nocturnal. They spend most of the day resting and move about more at night when predation is less likely. The majority of wild hamsters live in extreme climates, some of which can get quite cold in winter. These hamsters will hibernate deep down in the earth until the cold season ends. Short of venturing out into the deserts and sandy dune areas where most wild hamsters cohabitate, preferably with night vision goggles, you may be hard-pressed to find wild hamsters, even though they are undoubtedly there! Some zoos are now participating in ongoing conservation efforts to save Syrian and European hamsters in the wild. They may be a resource to discover more about viewing wild hamsters in their natural habitats. Wild hamsters are typically omnivores, like people. Thus, they can eat vegetation, grains and meat protein, depending on what food sources are available. The diet of wild hamsters even within a particular species may look different from day to day, depending on what food is available. The importance of getting a varied omnivorous diet cannot be understated. As this shocking article illustrates, when access to an appropriately varied food supply is restricted, wild hamsters can react in unusual and disturbing ways. 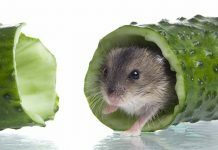 Common foods for wild hamsters today include seeds, grains, grasses, nuts, cracked corn, vegetables, fruits, insects, frogs, lizards, worms and other similar small protein sources. Each of these food sources is important, although they may eat some foods only at certain times each year when they become available. 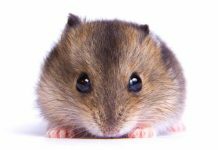 If you have kept pet hamsters for longer than five minutes or have observed them at the pet store, you have likely noticed they tend to be skittish. Everything startles a pet hamster, from loud noises to sudden movements to shadows to drafts. Sometimes, they are startled by seemingly nothing at all. In the wild hamsters are classified as a prey animal. This basically means they are a staple food source for many larger animals a few steps up on the food chain. So hamsters have evolved to be wary – on “high alert” mode all the time. Even pet hamsters that have never seen a wild predator (or even a curious house cat) exhibit these anxious behaviors. In the wild, hamsters are not at all socialized to people. They will run away if at all possible or simply stay underground and out of sight until nightfall, when it is safer to move about without being seen. In some cases, wild hamsters have been known to be highly aggressive. Wild hamsters have a jaw-dropping array of predators in their natural wild environments. It seems that just about everything likes to eat them, from snakes to birds to wild cats, wolves, jackals, foxes and other predatory mammals. Owls, weasels, jackals and even storks have also been known to make a meal of these mouse-like little mammals as opportunity knocks. Even pet cats, feral cats and feral dogs will eat hamsters. And even humans are not above dining on wild hamsters from time to time. You probably wouldn’t dream of dining on your pet hamster sidekick. Still, there are some parts of the world where wild hamsters are considered a necessary menu staple, if not precisely a dietary delicacy. As you can see, learning more about wild hamsters can help you better understand the needs of your pet hamster in captivity. Wild hamsters are resourceful, resilient, hardy little mammals that have to survive some pretty tough daily challenges just to stay alive, let alone to reproduce and carry on the species! Do you have a favorite wild or pet hamster species? Please drop us a comment – we love to hear about pet hamsters from our readers! Bradford, A. (2014). Hamster Facts: Diet, Habits & Types of Hamsters. Live Science. Illsley, C.L. (2017). Where do Hamsters Live in the Wild? World Atlas. Wynne-Edwards, K. et al (2018). Hamsters in the Wild. The British Hamster Association. Davis, B. (2017). What animals commonly eat hamsters in the wild? Sciencing. Zielinski, S. (2017). Wild hamsters raised on corn eat their young alive. Science News for Students. Gatterman, R. et al (2001). Notes on the current distribution and the ecology of wild golden hamsters (Mesocricetus auratus). Journal of Zoology, 254(3). Potočnik, J. (2018). About the European Common Hamster. Rise Foundation. La Haye, M.J.J. et al 2002). Strong decline of gene diversity in local populations of the highly endangered Common hamster (Cricetus cricetus) in the western part of its European range. Conservation Genetics, 13(2). Dunn, R. (2011) The Untold Story of the Hamster, a.k.a Mr. Saddlebags. The Smithsonian.